For six months, we have been parted by seas, school, and self-imposed solitude. It’s been a tough separation, and though we’ve striven to continued Patrolling, only in absence have we come to realize the joy of eating nachos together. Celebrating our very own Unification Day and inaugurating our 2nd annual New Years Day Nacho Patrol (the first didn’t go so well), we decided to slog through the hangovers and test the nachos at the Thirsty Scholar (warning: we love Monty Python as much as the next guy, but music on websites is so passé). First of all, we don’t know where the Thirsty Scholar got it’s name. Between the vomit outside and the college football on the television, this place didn’t exactly scream higher education. In fact, it seemed like just another Irish bar, with a bit of the townie flair thrown in for good measure. Nonetheless, we persevered and enjoyed some nachos. Excuse our photograph. Between us, we have one degree in an arts-related field and zero decent cameras. 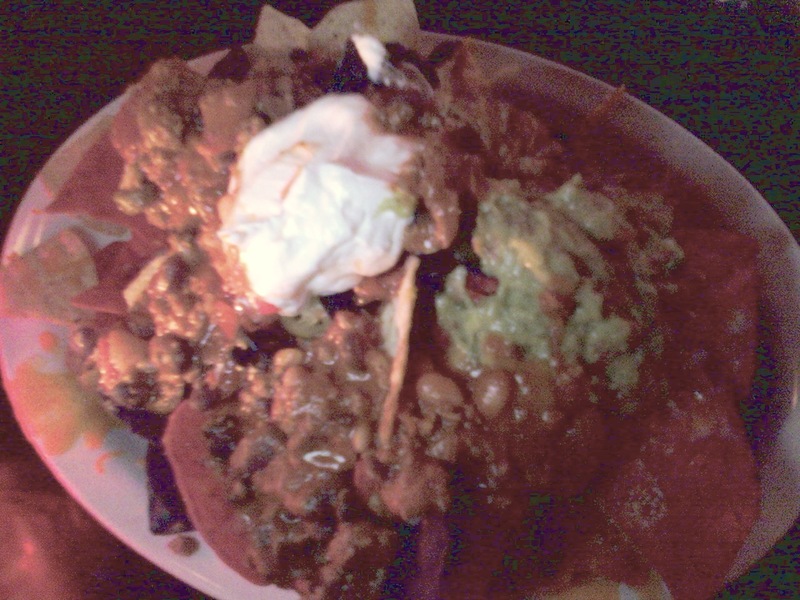 Appearance: (7) The picture may be crappy, but we promise these nachos were not that pretty. Globbed inelegantly on the plate, piles of cheese lay helpless, while gooey chili coated most of the multi-colored chips. Quality of Ingredients: (8) There was sausage in the chili, which we appreciated. The guacamole was quite tasty, and there were black olives too! Even the jalapenos were edible for us wimps. The chips were nothing memorable. Distribution of Toppings: (6) Not nearly enough cheese to go around, but the chili was everywhere and got the chips all soggy. Price: (6) Four dollars for chili? These were overpriced at $12. Overall: 27. But we’re gonna subtract one point for our practically non-existent waitress, so make that 26.